GoodReads Summary: "Like nothing you have seen before," raves Kirkus Reviews in a starred review. What I Think: There are so many things to say about this wonderful book. I think I'll start with Bob Staake himself. We love his books Look! A Book! and Look! Another Book! The are both huge hits in our house. His artwork is colorful and fun and reminds me a bit of Dan Yaccarino's work. This book has great illustrations that are very geometrical. Besides his unique style, this book is mostly in black and white...or maybe you would call it grayscale? He definitely uses the many colors of gray in between the black and white. The only other color is a light blue with the exception of the boldly colored bluebird. The artwork itself is impressive. 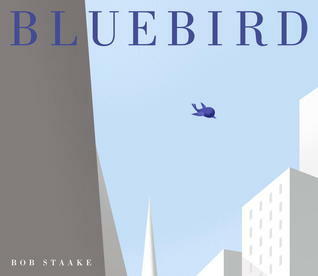 That artwork plays a large part in this story because Bluebird is a wordless picture book. Great artwork has to come together in just the right way to tell the story in a wordless picture book and Bob Staake does a good job of piecing together the story in this book. I read that this book took Bob 10 years of work and it seems clear the intentionality within every panel on the page. I read this with Peanut and since he's only 5, we definitely had to talk about the different things happening on every page. It really made him think about how we treat others and how fragile life can be. This is definitely a book that takes thinking and that would be great to talk about with kids to help facilitate their thinking. Wordless picture books are usually great to use to generate writing ideas and I think this book is definitely one of those. I especially think that older kids would be able to make connections with this book. Friendship and loyalty and courage are all present in this book. I can see connections being made to young adult novels. Hunger Games comes to mind but also Harry Potter and Shakespeare's Romeo and Juliet...and I'm only speaking from what is coming to mind quickly. There are definitely connections to be made here! Writing Prompts: Write about a time in your life when you did something to help a friend.